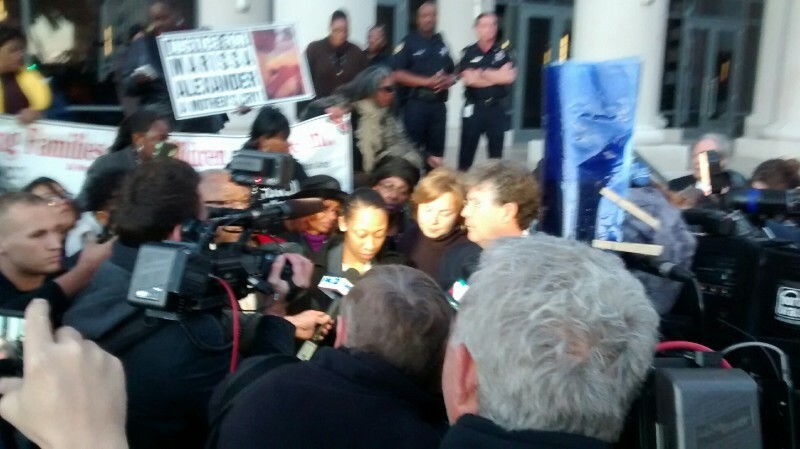 Marissa Alexander released from jail | Fight Back! 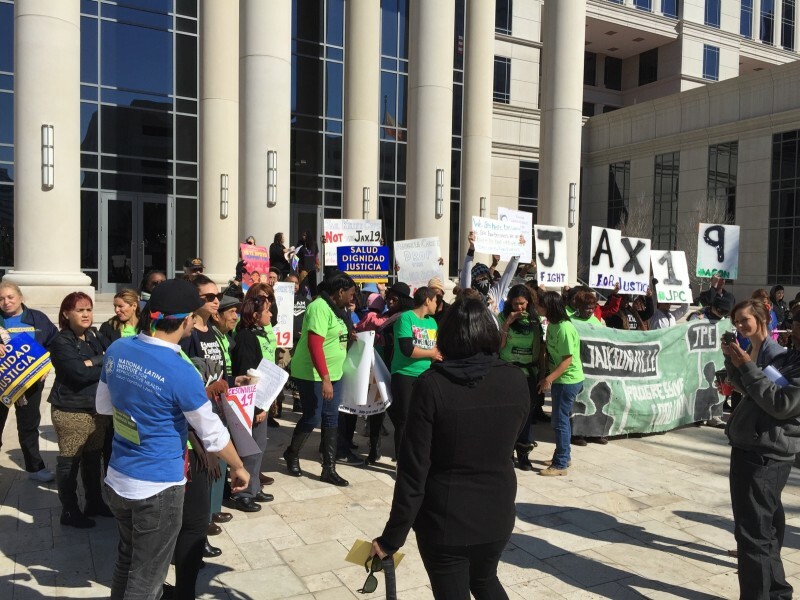 Jacksonville, FL – Activists, some coming from as far away as California, converged on the Duval County Courthouse bright and early on Jan. 27. Hopes were high, as Marissa Alexander was due for another day in court and faced the possibility of being released from jail. Marissa Alexander gained national attention when she was prosecuted by State Attorney Angela Corey after firing a warning shot in self-defense against her abusive and estranged husband. No one was hurt in the incident, but that didn't stop Corey from taking Alexander away from her children and putting her through the failed and broken system that ruins so many Black lives. At noon, a press conference was held in front of the courthouse to talk about Marissa Alexander and the case of the Jacksonville 19, who were unfairly arrested for protesting on a bridge after the racist Eric Garner verdict allowed killer cops to walk free. Several speakers, including some of the Jacksonville 19, spoke hopefully about Alexander's impending release from jail. 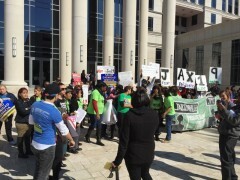 Protesters demanded that Alexander be released without any further trouble from the state, and for the charges to be dropped against the Jacksonville 19. A little after 4:00 p.m., applause broke out inside the courthouse when presiding Judge James Daniel announced that he did not approve of the prosecutor's request for an additional two years for Alexander and was releasing her from jail. The verdict however, is not a fair one by any means. The criminal injustice system is placing Marissa Alexander on house arrest for the next two years, where she must wear a GPS ankle bracelet. Alexander, a mother who has already paid so high a price for defending herself and her family, is out of jail but not fully free yet. Adding insult to injury, prosecuting attorney Angela Corey is the same attorney responsible for letting real criminals like George Zimmerman walk after killing Trayvon Martin, among other injustices. "It's hard to get a job, it's hard to get housing, it's hard to qualify for anything. Her life has been destroyed for this," Denise Hunt told reporters. Hunt is a local activist and member of the Jacksonville Progressive Coalition. After walking out of the courthouse, Alexander read a statement, saying, “Today, after the sentence given by Judge Daniel, my family and I will be able to move on with our lives. Although the journey has been long and there's been many difficult moments, I could not have arrived here, where I am today, without the thoughts, many thoughts and many prayers of so many people who voiced their support and encouragement. Words can never express my gratitude for those who stood beside me, including my children and family." Activists from around the country vowed to keep fighting for justice, but are glad Marissa Alexander is home with her children for now.